Admittedly, some people would be horrified at my church attire on occasion, usually pedal pushers and a coodinating top during the hot Arizona summers. It's mortifying to say that and I am trying to make a conscious effort to change. It's for this reason I decided to read Dressing with Dignity. Colleen Hammond's book, 'Dressing With Dignity' was nothing like I expected when I picked it up this weekend. Prepared for a simple primer on how to dress for the appropriate occasion and perhaps a few website resources, I was completely suprised thought provoking book and the enormous amount of research that when into it. Starting with Adam and Eve in the Garden of Eden and progressing through the centuries to the Freemasons and Coco Chanel, the author is meticuluous in her citations that back her explanations and opinions. She tracks women's slow slide down the path of feminism and explains why and how we all ended up in this morally corrupt society. It's a fascinating read that offers real solutions on how to return to modesty and femininity. The book was first published in 2004 and as I finished the book last night I wondered how much of an impact the Pure Fashion movement and books like Dressing With Dignity have had on people in the last five years. It didn't take long to get my answer. Today we all watched the memorial service for Michael Jackson. Except for the female singer with the wildly inappropriate clevege, everyone was dressed with the respect and reverence befitting the event. No wardrobe malfunctions in sight. It's my hope that in the future young ladies choose to conduct themselves less like Paris Hilton and more like Paris Jackson. 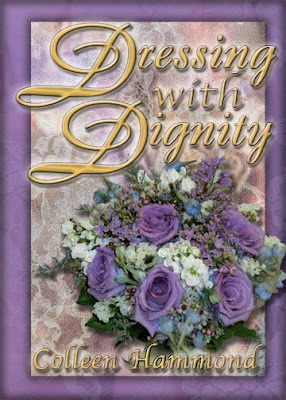 Dressing With Dignity is available at The Catholic Company.